Non-profit has formula for success. Thanks to a private, nonprofit corporation called the Madison Area Community Land Trust, the three bedroom, two bathroom houses, on the 800 block of Troy Drive, will be sold for just $99,500 each even through they're worth about $145,000 to $150,000. "We're selling them for less than it costs to build them," said Mary Myers, deputy director of the Land Trust: That, no doubt, will make the buyers happy. The construction of the homes has also cleaned up a lot that for 30 years was home to a convenience store with a history of causing neighborhood angst. So now, evolving North Side community is happy. "There's going to be some new, affordable homes on what was an eyesore," said Tim Carlisle, facilitator of the Planning Council, a coalition of 19 neighborhood associations on the North Side. It all started about 30 years ago, when a North Side family built a produce stand and orchard on the lot. The family eventually enclosed the produce stand and turned it into a year round convenience type store. When the family retired the convenience store was sold to an out-of-state owner who in turn leased the place to a string of "mom and pop" operators. By the 1990's, the convenience store was plagued with health code violations and rumors of food stamp fraud, drug activity and poor treatment of the many children who frequented the store. The situation came to a head in 1995 when angry and fed-up residents picketed the store. Even after the store closed, it continued to be a problem as kids broke in and sprayed graffiti. The North side Planning Council turned to the Madison Area Community Land Trust for help. 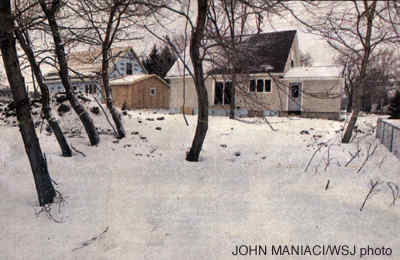 In 1998, the Land Trust purchased the property, and with the assistance of a Madison Fire Department train burn, demolished the convenience store. The Land Trust builds and renovates quality homes and sells them to low-and moderate-income buyers. Unlike conventional affordable housing developers, the Land Trust retains ownership of the land, which makes the purchase price lower and preserves the affordability for future buyers of the same house. When owners of a house are ready to sell, for instance, they do so according to a resale formula which splits the appreciated value of the property between the seller and the new buyer. "The great thing about Land Trust homes is they're not just affordable the first time," Carlisle said. Although Land Trust homeowners own their houses, they do not own the land on which the housed sit. Homeowners, who still remain eligible for all the legal and tax benefits of home ownership, instead lease the land on a long-term basis from the Land Trust. The Land Trust's model fits in well on Madison's North side, which in a decade has gone from having a reputation as a "trouble spot", to winning a neighborhood of the year award in 1999, Carlisle said. Community gardens on Troy Drive and the Warner Park Community Recreation Center are among the neighborhood's recent success stories. The Troy Drive housing project "will be part of a whole neighborhood turn around," Carlisle said. Although the homes, which are already being marketed, will be sold on a first-come, first-served basis to eligible first-time home buyers, Carlisle is hoping current North Side residents will buy the homes. Two of the houses will be completed and ready for sale in March, and the third will be ready in late spring. In a cost-saving measure that helped set the sale prices at $99,500, the Land Trust is marketing and selling the houses without a real estate agent. The project is also getting assistance from the City's Community Block Grant program. To qualify for the purchase of one of the homes, the buyer's family income must be 80 percent or less of the median family income for Dane County. For example, the maximum income for a family is $40,150; the maximum income for a family of three is $45,200; and for a family of four, $50,200. Homeowners will also save money on energy costs down the road because the housed are being built to Wisconsin Energy Star and Green Built Homes criteria. The two-story houses, being built by Windsor Homes, each have three bedrooms, two full bathrooms and an oversized one-car garage. The front exteriors of the houses and the interior design vary slightly, but all three houses include the same basic layout and features. "They're the same style, but they're not cookie cutter," Myers said. With a total size of 1,350 square feet, the first floor of each home consists of a living room, bathroom, a bedroom with a walk-in closet, kitchen, and a separate dining room with sliding glass door that opens up to a wooded back yard. The remaining bathroom and two bedrooms are on the second floor. The large basement, which could easily be finished for a recreation room at a later date, also has laundry hookups. The homes have laundry chutes and lots of closet space. All kitchen appliances, including a dishwasher, refrigerator and stove are included in the sale price. The houses are situated across the street from the Vera Court area, which has been revitalized in recent years. Mendota Elementary School is about a block away. After the houses are sold, the Madison Area Community Land Trust is hoping to develop the rest of the former convenience store lot with more affordable housing. Myers said Land Trust hopes to put in a cul-de-sac with up to 13 more houses or duplex units. There's also talk of a small office building, or perhaps, a child-care facility, Carlisle said. A time line is still unclear for when that development might occur. In its 10 year history, the Land Trust has assisted 23 income-qualified households to achieve home ownership. Founded by Sol Levin, former executive director of the city's housing and redevelopment authorities, the group now holds nearly $1 million worth of land in trust for the community.